Here come the Polar Pals to brighten your day! Aren’t they the cutest little buddies around? 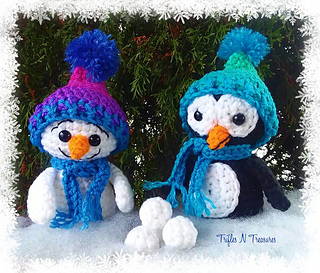 Measuring in at just 5” tall (without their hats), these two little darlings work up FAST! 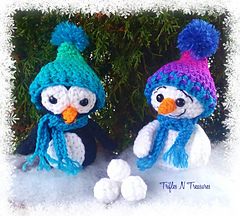 Pattern includes instructions for the snowman, the penguin, their hats and scarves, and their pile of snowballs! Grab your scraps and get to work!